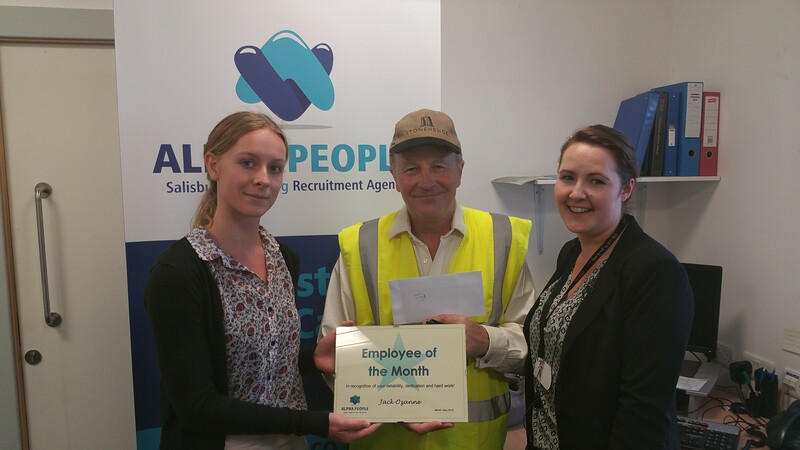 We are very happy to announce our May winner of the Employee of the Month Award… It was a close run between two really good candidates, but we have decided that the award goes to Mr Jack Ozanne! Jack has been doing various temp job assignments for us, such as Events Steward, Customer Service Assistant and Exhibitions Assistant. Amongst others, our Client reported that Jack ‘‘is always well presented and professional” and that he ”does a great job of engaging with customers in the exhibition.” Jack obviously goes beyond the call of duty and takes pride in his job. We are very happy with our Client’s feedback and with all the work Jack has done for us. We hope he will continue to do so in the future. Ivor and Melanie went to see Jack on site and surprised him with the certificate and a £25 gift voucher. Jack being a no-nonsense man, he calmly, but happily accepted his award and then went back to work. Congratulations to Jack! Thank you for all your hard work!